Have I mentioned how much I love breakfast casseroles? I love going to MOPS and bible study and brunches especially for the food. 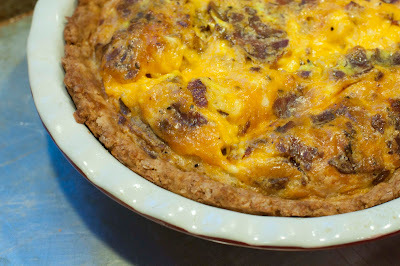 Last week, I had to make something for my bible study and I decided to make a quiche with bacon. I had made one with sausage and I love it, but I didn't have any sausage. I actually used turkey bacon, which in my opinion tastes the same. To change things up, I used a different crust. I actually used the same crust I use in my Pigs in a Blanket and let me tell you, it was perfect! I love that dough, mainly because it has cheese in it and I have a thing for cheese. The great thing about making the crust for this is that you don't have to roll anything out. Just plop it in the pie plate and spread it out evenly. It's that easy. Feel free to add mushrooms, onions, etc. to this. I'm a plain jane kind of girl, so mine just has dairy and meat. Enjoy! 8 slices bacon, cooked and crumbled. **If you don't have time for homemade crust, just use a store-bought one. In a large mixing bowl, sift together the flour, sugar, baking powder, baking soda and salt. Using a pastry cutter or two knives, mix butter pieces into the dry ingredients until mixture is crumbly. Stir in cheese until evenly distributed. Make a well in the dry ingredients and add the milk. Stir well with a wooden spoon or spatula. Let the dough rest for 3 minutes. Sprinkle the dough with flour and stir once or twice. Grease a deep pie plate or spray with nonstick spray. Place dough in pie plate and, using fingers, spread it out to fill the dish. Set aside until ready for egg mixture. Cook bacon and drain off any grease on paper towels. Let bacon cool and then crumble it and set aside. In a large bowl combine the eggs and milk. Add the bacon and cheese to the egg mix and mix well. Pour into an unbaked crust. Bake at 350 for 1 hour or until set. Insert toothpick or knife to test for doneness. If you're concerned about the crust burning, about half way through, cover the crust with foil. You can just lay a piece of foil on top of the quiche. Love quiche! And I love bacon quiche :) I have never made a crust for quiche, I always buy mine from the store, but yours looks really good! Love that you added cheese to your crust; exta little zing.